Mono Lake is an ancient saline lake located between the arid Great Basin and California's part of the snowy Sierra Nevada mountains. This remarkable lake covers over 70 square miles and supports a unique and productive ecosystem. Although, there are no fish in this lake, it is home to trillions of brine shrimp and alkali flies. Adding to the incredible beauty of Mono Lake, the freshwater streams that feed it support the lush riparian forests of cottonwood and willow lining its banks. Along the lakeshore, you can see scenic limestone formations, known as tufa towers, rising from the water's surface. 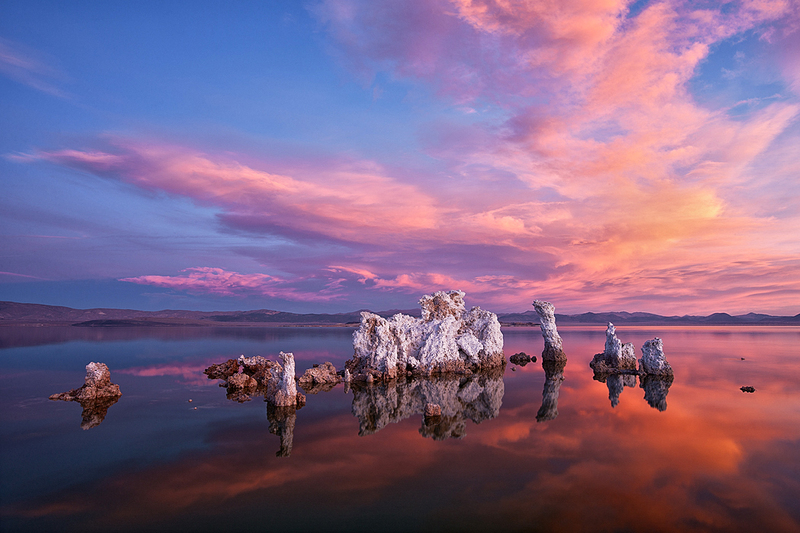 Because of its unique location and formations, Mono Lake is a perfect photographic combination of mesmerizing location, dynamic weather and an alien-like landscape.